Over the course of the Kolacky Days Weekend, there is a variety music and entertainment options for one to take in. "Czech" them out below! In Memorial Park on Friday night, music starts at 6:00 p.m. Music under the park shelter is from 6:00 - 8:00 p.m. The 2019 Musical Performance will be Jumpin' at the Woodside! At 8:30 p.m. the Park Dance starts! it goes from 8:30 p.m. to 12:30 a.m.! The 2019 Friday Night Feature Band is the Blue Ringers! The local dance studio offers a summer performance on the Main Stage in Memorial Park at 11:00 a.m. It's a chance to see these young dancers amazing talents as well as an opportunity for them to shine! In 1984, Kolacky Days' program added the Old Time Musicians Jamboree. It's open to the public and people are encouraged to dance, listen, and sing along to the area's most popular dance music. The Jamboree is organized to promote Montgomery's ethnic music. Get a taste of it below! It runs from 12:00 - 3:00 p.m. in Memorial Park. The Log Cabin in Memorial Park is open for Kolacky Days. It houses relics left by the early pioneers. It was built and donated by the Pioneer Historical Association of Montgomery in the spring of 1931 and 1932. Every Kolacky Days a display of Montgomery and Kolacky Days memorabilia is viewable for the public. It is put on by the Montgomery Historical Society. From 3:30 - 6:00 p.m. FREE music will be provided under the Main Stage. The 2019 Musical Group will be the Nite Time Boogie Band! From 6:00 - 8:00 p.m. Old Time Music will be provided under the Main Stage. The 2019 Musical Group will be Larry Novonty Trio Band! At 8:30 p.m. the Park Dance starts! it goes from 8:30 p.m. to 12:30 a.m.! The 2019 Saturday Night Feature Band is Pop Rocks! From 1:30 - 5:30 p.m., music will be playing on the Main Stage. The Charlie Sticha Band will be playing in 2019. The Log Cabin Display will be open again on Sunday from 1:00 - 4:00 p.m. Every Kolacky Days a display of Montgomery and Kolacky Days memorabilia is viewable for the public. It is put on by the Montgomery Historical Society. In the heart of Memorial Park, the St. Paul Czech and Slovak Folk Dancers perform at 2:00 p.m. 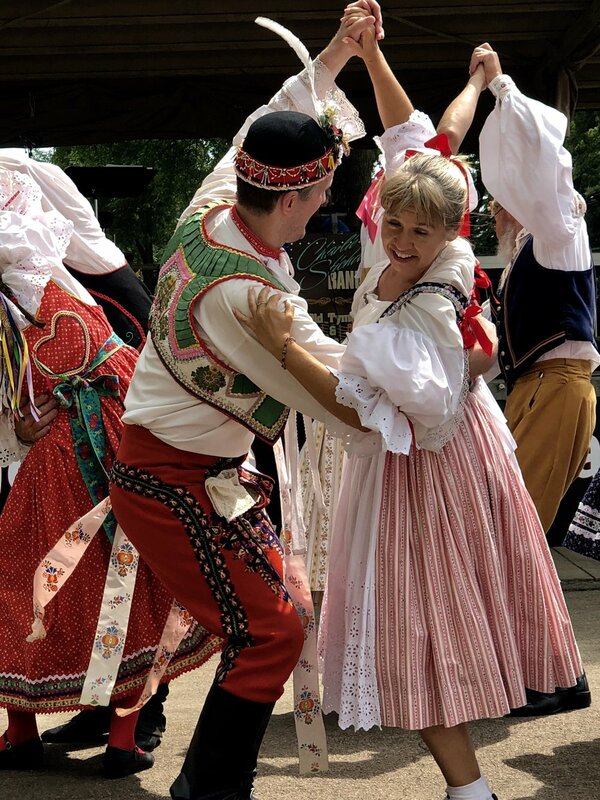 The St. Paul Czech and Slovak Folk Dancers are an ethnic dance group promoting the Czech, Moravian, and Slovak heritage and culture. The group was formed in 1962 to display Czech (Bohemian and Moravian) and Slovak culture through dance. Come see this wonderful presentation on Czech Heritage!